While Apple's critics might prefer to credit Xiaomi for Samsung's decline, the South Korean giant's plummeting profitability is not due to a major drop in its low priced, high volume phones and tablets but rather an implosion of Samsung's profitable, high end Galaxy S and Note models that directly compete with iPhones--including its Galaxy Note 4 flagship that launched at the middle of the second half of the year. Samsung's Note 4 launch was hyped by tech media writers, including Brad Molen of Engadget, who called it "the best big-screen phone you can buy right now." That claim was supported by misleading benchmarks that obscured the reality that Samsung's Note 4 shipped with screen resolution that its processor wasn't engineered to handle, further dinged by Google's lackluster OpenGL performance in Android. It's even more clear today than it was in the previous quarter that smartphone buyers were opting for Samsung's larger phablets like the Note series purely because of the large screen, not because Samsung was "innovating," not because of anything particularly attractive about Android as a platform and certainly not because of a purported edge in performance or all of those ecstatic reviews (neither of which were true). As soon as Apple released its own large screen iPhone, the popularity of Samsung's Note collapsed. Estimated phone shipments from Strategy Analytics suggest that Samsung's total phone volumes in Q4 were only down 13 percent over the year-ago quarter, but the company's reported profits from mobile plummeted by more than 64 percent. In Q3, Samsung announced a similarly devastating 74 percent drop in its mobile profits. Analysts have been noting through 2014 that the company faces increasing competitive pressure from both Apple on the high end and from high volume sales of lower end models increasingly being produced by Chinese companies, in particular rising star Xiaomi. Samsung is clearly facing a battle on both fronts. However, based on the numbers the company has reported, the catastrophic drop in profits Samsung suffered in the third quarter has come from a thermonuclear assault by Apple targeting its core revenue and profit generators: the high end phones that had been contributing most of the profits of the entire Samsung Electronics. The damage Apple has caused Samsung will only get worse as the company's low end is ravaged by other Android licensees. Samsung still hasn't paid Apple the nearly $1 billion judgement it was ordered to pay back in 2012 for patent infringement. However, it did report a much larger $3.2 billion YoY drop in quarterly profits within its IT & Mobile Communications (IM) group--which is roughly comparable to Apple's operations, following the previous quarter's $4.7 billion drop. The cause of this sudden collapse in profits is not a mystery. Samsung's profit collapse was not principally due to Chinese phones flooding the market. IDC reported that Samsung's phone shipment volumes in Q4 were even better than Strategy Analytics surmised, estimating that numbers were down by just 11 percent. For Q3, IDC similarly reported a YoY decline of just 8.2 percent. Samsung itself reported only a "slight decline in smartphone shipments" in Q4, following a sequential "slight growth in shipments" in Q3, when Samsung flat out stated that its phone shipments in the quarter were "driven by mid to low-end products." Going forward, Samsung guided investors to "expect smartphone competitions to intensify" in 2015. That means Samsung missed out on high end sales. While IDC had estimated that Samsung's total sales were down just 8.2 percent, analyst Ben Bajarin reported that Samsung's premium phones were down by nearly 50 percent in Q3. Given that premium phones have historically made up about a third of Samsung's total unit sales, that indicates that Samsung not only lost lots of high end sales, but also substituted profitable sales with unprofitable volume filler, resulting in a "weak smartphone product mix," exactly as the company admitted. Apple earned 13.4 times as much money as Samsung while shipping roughly the same number of phones, by selling higher end iPhones rather than "carrier friendly, good enough" devices. As a result, Samsung's mobile division reported just $1.8 billion in operating income in Q4, down from $5 billion at the launch of its Note 3 last year. Apple's operating income was $24.2 billion, up 36.9 percent over the year ago quarter. That means Apple earned 13.4 times as much money as Samsung while shipping roughly the same number of phones, by selling higher end iPhones rather than "carrier friendly, good enough" devices. Samsung is fully aware of the value in selling higher end products. In its most recent earnings statement, it communicated to investors that its plan for 2015 involved both a "focus on increasing smartphone shipments and securing profitability with new product portfolio." 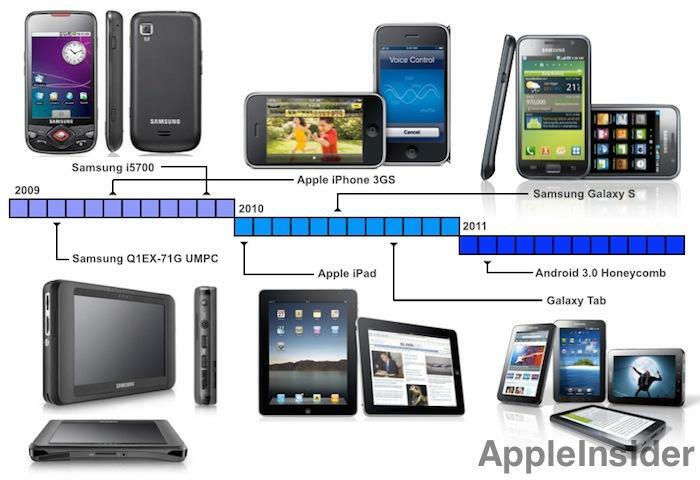 Since 2010, Samsung's product portfolio has largely been based around copying Apple's iPhones and iPads. Targeting Samsung's tenacious "fast follower" role--including its cloning of Apple's product designs, user interface features, product configurations, capabilities and even its marketing and packaging--has been difficult for Apple, and particularly fruitless in the courts, which have taken little action to protect Apple's patented inventions. To devastatingly eviscerate Samsung's most valuable targets--effectively bombing Samsung back into its Stone Age prior to its copying the iPhone--Apple needed a very sophisticated warhead. Producing a large screen phone with adequate 64-bit CPU and leading GPU processing power to drive it, and then giving it clearly differentiated features including Touch ID and Apple Pay as well as Continuity features that tie it into the Mac desktop, iPad and the upcoming Apple Watch, were all elements of a "thermonuclear" plan to strip Samsung of its Galaxy S and Note 4 profit engines. Strangely, while analysts regularly expressed concerns about Apple deriving more than half of its profits from iPhone, nobody in tech media blogs seemed concerned that an even greater percentage of all of Samsung Electronics' profits were coming from its version of the iPhone, or about what might happen if those revenues were to ever collapse. Apple has long earned more money than Samsung while exclusively selling only higher end ($400+) iPhones. In fact, while Samsung was routinely reported to have shipped twice as many total phones as Apple, Apple was earning twice as much profit (it's now earning 13.4x as much, while selling about the same unit volume of devices). The profits Apple was earning allowed it to make massive investments in OS software, apps and custom silicon. In contrast, Samsung largely relied upon licensed Android software from Google, Android apps from Google Play and generic Application Processors from Qualcomm (or off the shelf ARM chip designs printed in Samsung's own System LSI fab). Instead, firms like IDC have been blindly serving up smartphone market statistics focused entirely on shipment volumes and market share, regularly congratulating Samsung on its ability to ship huge volumes of devices. Now that Samsung's high end phone profits are collapsing, IDC is drawing attention to other companies that have the exact same focus, with no apparent recognition of cause and effect. Xiaomi was hailed by Bloomberg in September 2013 when the emerging vendor's president Bin Lin stated in an interview that it had turned a profit for the first time, although the report noted that "he didn't supply a figure for profit." Instead, he focused on shipments and market share. However, in December 2014 it was revealed that Xiaomi hadn't really been very profitable at all, having earned just $56 million in all of 2013, one tenth what the Wall Street Journal had initially reported. 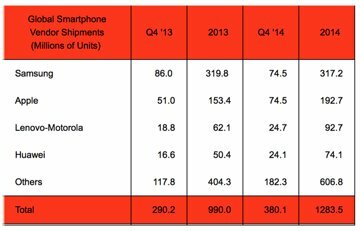 Lenovo and LG, both nearly tied with Xiaomi for third place in quarterly unit shipments, are also focused on shipments and market share. In its most recent earnings report, Lenovo doesn't detail its profits by segment, but called attention to its "record worldwide smartphone shipments, up 38 percent," achieved despite a 6 percent revenue decrease from smartphone and tablet sales. It noted overall gross margins of 13.9 percent. 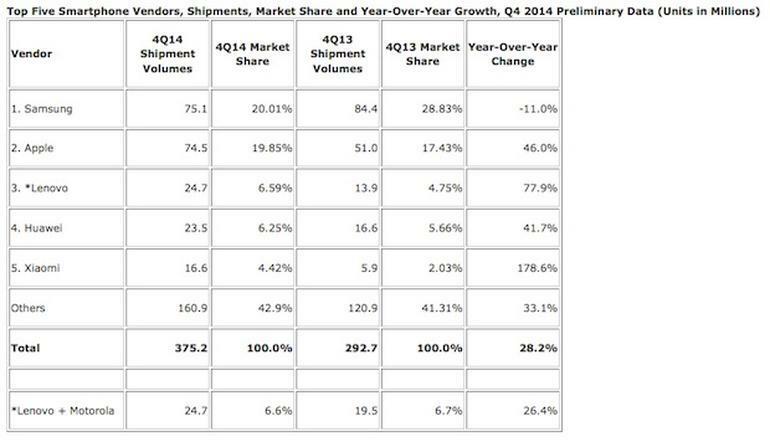 Apple's margins are 39.9 percent. LG reported an 18 percent YoY increase in smartphone shipments within its mobile group, but its profit margins collapsed to 1.8 percent from 3.8 percent in the previous quarter, when it had reported that its "profitability improved widely." LG could double its profitability and quadruple its sales and it would still be earning less than the beleaguered Samsung. Meanwhile, IDC has gravely warned for years that Apple's market share continues to slip--in both smartphones and tablets--as it discovered new ways to increase its Others category to insure that its statistics keep telling this story of slipping market share. However, Apple's profitability has continued to remain spectacularly high, even as shipment and market share leaders shifted from Motorola to Blackberry to Nokia to Samsung as their predecessors imploded in failure. Apple has made it explicitly clear that its goal is not market share but rather profitability, something that's only achieved by building great products that people want to buy. Gunning for market share is much easier: just ship tons of cheap products, and if necessary, give them away. Without any obvious way for Samsung to differentiate its Android products--an issue that Google and Samsung had been fighting over throughout 2014--Samsung faces another big problem going forward. The problem there is that maintaining a unique platform is very expensive. Microsoft and Google have both financed their mobile platforms using their high profit margins on software and services related to the PC desktop. Samsung's profits come primarily from its mobile phones, but even those profits (before they collapsed) generated half the margins of Apple (and an even smaller fraction of the 70-80 percent gross margins Microsoft earned up until last summer, or the 60 percent gross margins of Google). And as Amazon demonstrated last year with its Fire Phone flop, trying to create a new smartphone platform with meaningful differentiation--even when starting with working Android code--involves a lot of resources and tremendous risk. After years of bloggers explaining how Apple's profitability would be eroded away by commodity Windows and then Android licensees makers, Vlad Savov, writing for the The Verge, sought to explain away Samsung's current problems by stating that all the company really needs to do is produce a "portfolio of better-designed phones," a sentiment echoed by Samsung itself. Going forward Samsung will lose its position as the default alternative to Apple; Xiaomi is already an even more shameless copy of Apple than even Samsung. And at the same time, Google has partnered with HTC, Asus, LG and Motorola to launch its latest Android 5.0 Lollipop on Nexus branded devices. Without a dominant Samsung defining Android, Google will likely find itself dealing with more AOSP vendors (like Amazon, and most vendors in China), making use of Android without the obligation to follow Google's directions. That could lead to greater innovation and more experimentation, albeit without benefiting Google. In any case, Android now faces a huge wildcard because its largest advertiser and most dominant licensee by far is experiencing a major collapse in profits due directly to its use of Android.